Drake is a new student at the High school and his hiding a big secret about his life. Emma finds 0ut and she becomes part of it. This short story is titled bloody past because it reflects what happend to drake in the past. Something was bothering me when I looked into the boys eyes. Something terrifying. They were filled with hatred, anger, and rage. "Are you alright?" I asked nervously. He didn't respond. I went closer to the 18 year old boy standing in front of me in the lunch line. As I got closer, I felt this weird sensation to run. A weird feeling to run away from him. I shivered and shook the feeling off. I walked closer cautiously. "Excuse me-"
"What do you want?!" The boy shouted. I got startled and backed away a little. His face was starring right at me. "Pale." I thought. "He's so pale." He let out a sigh. "Just leave me alone, Okay? Don't talk to me." He turned his head away and started to walk to the lunch trays. Anger filled inside of me. "Excuse me?!" I blurted. I didn't even know him. All I was doing was being nice and asking him what was wrong. He stopped walking immediately. "You know, you need to chill. You couldn't have just said you weren't in the mood to talk? You don’t need to be a jackass when someone's trying to be nice to you." He started speaking in a low, calm, monotone voice. "Leave me alone. Don't get me mad." He slammed the lunch tray back down and walked away. I got my lunch and went to the table i normally sat at. I noticed that the boy was sitting alone at a table. "Whatever." I thought. My friends Kyle and Amy were staring at me. "What?" I asked in attitude. Kyle responded. "Dude, do you even know who that is?" I shook my head. "I haven't seen him here before but it doesn't matter. He's a jerk." I said in disgust. "That's Drake James, Emma! He moved here from no one knows where. Rumor is he killed his 7 year old sister. His parents tried calling the police but they never did. He killed them. “Amy whispered. I had to laugh. "Amy that is the lamest thing I have ever heard. Where did you here that from?" Amy points to Kyle. Of course. He would think that. "And you would believe him...why?" I asked with a weird expression. I turned around and looked at Drake. He was looking at the table but after I blinked, he was starring right at me. “Whoa.” I thought. "I don't know. He looks like someone who's tough. He looks like someone who would do that type of stuff. But he is hot." I looked back at Drake. Richard, The high school quarterback, also known as the school bully, walked by and pretended to trip. His lunch spilled all over Drake. Richard started cracking up with the whole school. I noticed Drake's eyes. They looked so red. He stood up so fast. He grabbed Richards’ shirt and lifted him off the ground. "You want to try that again, Punk!?" Drake nearly spewed out the word punk. Richard kept on laughing. "Oh. I am so scared. Look who's acting tough everyone!" Richard said sarcastically. He just kept laughing harder and harder. Drake kept staring at him with a revolting look on his face. "Oh my god! Richard just shut the hell up!" I screamed at him. He spewed towards me. "Of course," I thought. "He is so 'cool'." "You shut the hell up! I don’t need an idiot telling me what to do!" He started laughing again. My face turned red. Drake looked at me still making his vicious look. I thought I saw it turn a little less menacing when he looked at me. Drake punched Richard hard across the face and threw him across the cafeteria. Drake started to leave. He looked back at me quick to see me chuckle a little at Richard. I could have sworn I saw him smile. Richard had it coming. The next class was English for me. Richard wasn't in here, neither was the teacher. An ambulance arrived shortly after the fight. Drake made it in right before the bell rang. I looked to Kyle whom was sitting next to me on my left. “I’m surprised no one ratted Drake out yet. He could get in serious trouble.” I told Kyle. There must have been people eavesdropping on my conversation. “Are you kidding me? No one wants to. They all think Richard deserved it.” A blonde girl said sitting behind Kyle. Kyle nods in agreement. I had an idea. “Hey, what if I got to know Drake a little bit more. Maybe he isn’t such a bad guy. Maybe he’s just having a bad day, that’s all.” Kyle and the girls’ eyes got big in disbelief. The girl turned away and started talking to someone else behind her. “I guess. Be careful though. If he can lift Richard up and throw him 10 feet, who knows what he could do to you?” Kyle warned. I gave a half smile and shook my head. When school was out, I walked outside, looking for Drake. I asked a couple of people but they didn’t know where he was. I asked the girl who was sitting behind Kyle in English class and she said she had seen him. “He went in the ally somewhere over there.” She pointed to the left of the school where there was a crammed ally way. “Thanks Sierra!” I shouted as I was walking towards the ally. The ally was dark. It wasn’t pitch black but there was no sun shining in it at all. It was kind of damp too. There was trash and litter all over the place. It was disgusting. As I walked cautiously into the ally, I heard a noise. It sounded like a man screaming. I walked more sluggishly. I walked around a corner to find a shocking sight. A man was cradled in a corner. He had blood streaming down his neck. “Sir, are you alright?” I started running towards the poor, injured man. “HSSSSS!” The man bared out his teeth. His eyes were glowing red. I noticed something about his teeth. 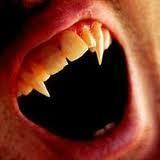 They were fangs. “AH!” I scream. I backed away and bumped into something. I turned around to see Drake wiping blood from his mouth. “Ah!-“He covered my mouth. “Why would I?” I asked shaking in fright. “Well, when this other girl found out what I was, they totally freaked and ran off. She said she was calling the police because I killed someone.” He replied. He put his hand over my shoulder and led me to a bench. I had the goose bumps. “He is cold.” I thought. “Did you go to jail?” I asked as I sat down. He started to laugh. “Hell, no! I killed her!” Shock registered my face. He killed her? “Y-you did?” It was nice to see him smiling. Even though his skin always stayed pale, it made him look like he had some color besides white skin and black hair. I just didn’t like that he was smiling because he killed a girl. “Yeah, I kind of had a bloody past, if you know what I mean.” He showed me his pure white fangs. “No,” I thought. “I don’t know what you mean.” Tyler let out a sigh. “I heard Amy tell you about the rumors. They are a lie. I didn’t kill any of my family. I would NEVER! Yeah, they were killed...but not by me. They were killed by that man over there!” Drake pointed to the vampire over there that I wanted to help earlier. Drake read my mind. I guess that’s and ability vampires have. “He was a vampire hunter. It was on a stormy Friday night. He found me and my family in a graveyard.” He lowered his eyes to the ground. “They got Lilith first. She wasn’t 7, she was 6. She was killed at a young age. My parents told me to fly away. They jumped in front of the VH truck. It stands for Vampire Hunting Truck. The headlights caught them and they were stabbed in the heart with a steak. I witnessed it all from the night sky. Ever since then, I have been tracking him down.” Drake stood up and gave me a hand. I took it and he helped me up. “Why didn’t you kill him right away instead of making him into a vampire?” I asked confused. He laughs. “I know you can’t fly. I mean I fly you.” I was puzzled. “We hold hands.” He said. “OH! Sorry, I’m still a little shocked that you’re a vampire.” I said. “Yeah, sure. I’ll love to go flying with you.” He smiled. He grabbed my hand and jumped into the sky. “Whoa! Whoa! Haha! This is kind of fun!” I bellowed. “It must be cool being a vampire. You know, having these cool abilities and stuff.” Drake and I looked into each other’s eyes. It’s like he knew what I was going to ask next. “I thought it was Lilith.” I interrupted. “I’ll get to that. I screamed when that knife went through her heart!” I started to tear up. I could see everything that was happening that night. Drake was sending me the message, literally to my head. “My Dad tried to fight them off but there was too many for three people to take on. They got my mom and then my dad. I was last. I was cut badly. I had blood coming out of me from everywhere. I lay there on my back, gasping for breath. Connor came up and just stabbed me. Right in the heart.” We landed on top of the Eifel tower. “Wow. We traveled fast.” I thought. “Yeah. Vampires can fly really fast.” His face was sad. I leaned over to give him a hug. “There was a vampire named Vlad. We are two bloodless pals to this day. We were fresh kill. In the book called How to Turn a Human into a Vampire, It says that humans still can be bitten if they still have fresh blood in them. We were just killed which meant we had plenty of fresh blood in us. He bit me and my family. After a few minutes, we were born again. Well, Vampires. But now, I’m the last one again.” He turned to face me. I saw that his eyes were damp also. “Be with me, Emma. Be mine. Be a part of me.” I saw a twinkle in his eye. My long brown hair blew in the wind. My hazel eyes glistened in the sun. “Please.” Drake begged. I could tell he wanted me to be a vampire with him. He had fallen in love with me just like I had with him. “This is my answer.” I whispered. I moved close to him and he did the same. We kissed under the warm sun. I pulled away just barely to tell him something. “Bite me.” I whisper encouragingly. Drake opens his mouth and shows his pure white fangs. He gently turns my head and sinks his fangs into the side of my neck. I’ve never felt something so bad, feel so good. I felt the venom enter my body. My heart slowly stopped. I couldn’t breathe. I am dead. Just like Drake. His teeth exited my neck leaving two holes. I feel my teeth and find fangs. I look at him and smile. “Thank you.” Drake whispers. I nod. “You had a bloody past, Drake, but together we can have a bloodless beginning.” We lean towards each other and kiss.